Yuvraj Singh lent his voice for a Bollywood animated film Jumbo. Sachin Tendulkar holds a record for having scored the most number of runs in all ODI World Cups. Ricky Ponting has most ODI victories under his belt – 122 in total. Brendon McCullum has hit the most number of sixes in T20 games till now – 23. Rahul Dravid was nicknamed Jammy because his father worked for Kissan Products Ltd., a jam company. Yuvraj Singh's father Yograj Singh has also played cricket for India at the international level as an all-rounder. Sachin Tendulkar owns a three restaurants – two in Mumbai and one in Bangalore. He owns them in partnership with Mars Restaurants. MS Dhoni's long hair became a craze but he cut it so he could look more like his favourite film actor John Abraham. Sanath Jayasuriya holds the record for having scored the most number of ducks in ODIs – 33 in total. Aishwariya Rai and ad guru Prahlad Kakkar have one thing in common – they both have been Sachin Tendulkar's neighbours! 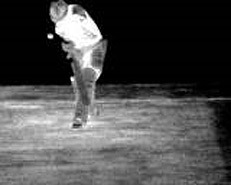 HotSpot is a television innovation - first seen during Channel Nine's coverage of the 2006-07 Ashes - that uses infrared camera technology to determine whether a batsman has made contact with a delivery, and if so, which part of his bat or body made contact. Two powerful thermal-imaging cameras are positioned above the field of play, behind the bowler's arm at either end of a ground. These can remotely sense and measure the minute amount of heat generated by the impact of a cricket ball against another object. Computer technology then generates a negative image on which the point of contact is highlighted as a red friction "hot spot" for a second or two. HotSpot doesn't only record impacts between the ball and other objects, but also the bat hitting a pad or the ground. If there are two simultaneous hot spots - ball on pad and bat brushing pad - close together, how do you differentiate? Two hot spots would appear, one fractionally before the other, according to the sequence of the events. HotSpot is therefore useful in instances of bat-pad impacts in determining whether the ball hit bat or pad first. What technology does the application use? HotSpot uses technology developed in the military for tank- and jet-fighter tracking. The technology was adapted for television by BBG Sports, the Australian company responsible for the Snickometer, in conjunction with Sky Sports. Channel Nine producer Steve Crawley described HotSpot as "100% backed up by science", as opposed to other applications. Has it been used in any other sport? HotSpot has only been used in cricket - though its services are not available to umpires under the current referral system - but work is underway to adapt the technology for use in tennis.